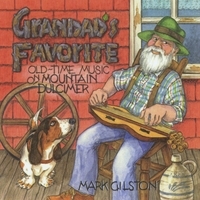 Grandad's Favorite is an exciting collection of wonderful old-time tunes masterfully played by mountain dulcimer virtuoso, Mark Gilston. Mark Gilston has been performing traditional folk music for over forty years. His vast repertoire encompasses songs and instrumentals from North America and most of Europe, particularly the British Isles, Scandinavia, and the Balkans. His performances are laced with humor and a wide base of eclectic knowledge. Mark, an award-winning mountain dulcimer player, also plays concertina, guitar, banjo, Bulgarian bagpipes, pennywhistle, ocarina, tambura, and others.